Happy Friday everyone! I have a fun polish to show you guys today. A few months ago, I saw at Ulta and saw that Layla had a new collection out. Layla is an Italian brand that is available online and for us in the US, available at Ulta. Layla seems very ahead of the curve when it comes to nail polish and trends. They were the first brand that made magnetic nail polish available for us in the US. They also came out with a holographic line about a year before everyone else started releasing holographics. And now, they came out with a texture collection called the Ceramic Effects. I only picked up 3 of the polishes, but the Ceramic Effects polishes are a mixture of mattes, chunky glitters in a jelly base, and flakies. When I saw this collection, this was the first polish I grabbed because it looks like its a dupe of an NfuOh polish that I’ve wanted for about 3 years! Layla CE52 (they don’t have names) is a dark purple sheer jelly base with opal flakes. Can you say amazing! My camera couldn’t capture the gorgeousness that is this polish and turned it more blue. In real life, its the perfect deep purple without much blue. The flakes shimmer mostly red but you do get the entire spectrum at the right angle, where it changes from red, orange, yellow and green. The formula was pretty sheer and easy to manage. It was 3 coats to get opaque and the dry time was pretty slow. But the jelly finish means that you can wear this on its own or you can layer it over other colors. 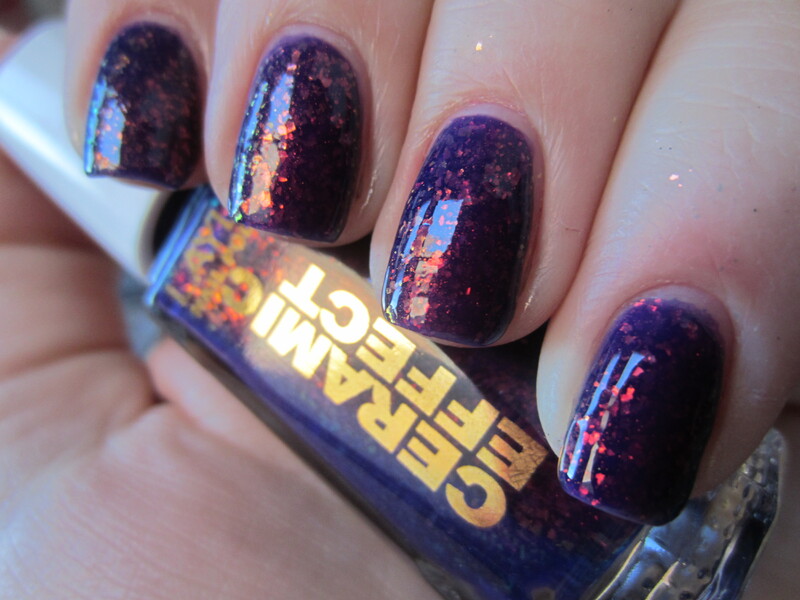 So if you have a red or blue polish you want to liven-up, this would be perfect. What do you guys think of this polish? What are your favorite flakies? oh i love the combo of red and black! i may have to check that one out! oh yeah i love it! can you get layla near you? I have this one too and I love it!! Beautiful sparkling polish and the flakes, oh man!! One of my favs. It really gets smooth when it dries too. Surprisingly so. But it does take awhile to dry and I wish it wasn’t so much for one little bottle! same here! it was almost $10 for this freaking bottle but its so pretty. and you’re right it dries to such a smooth finish its awesome! This is very much a dup of Deborah Lippmann’s ‘Ray of Light’. Love it. I love this! I like that it is so over-the-top glossy, and I really have a thing for layering different nail polish colors. I`m going to try this one out for myself! its great! i haven’t tried layering it yet but it is so glossy. if you come up with any cool layering combos please let me know! I love polishes with a jelly formula and this one looks absolutely fantastic! I really wish we had Ulta in Canada, you guys seem to get some really cool stuff there that I haven’t seen up here yet. Thanks for sharing Holly, more for the online shopping wishlist!